Der Graf sired 100% Gold Premium foals in 2005, including champions of three keurings, in three different states! Noblesse Oblige… Der Graf offers American breeders a special opportunity to breed to the very best bloodlines Europe has to offer. From the celebrated Donnerhall x Pik Koenig cross, with the powerful heritage of Graphit as well on his mother's line, Der Graf offers his own brand of royalty for American breeders. Der Graf's foals have been topping the ranks of the nationwide RPSI keurings year after year. Der Graf sired 100% Gold Premium foals in 2005, including champions of three keurings, in three different states! In 2007 SIX of his foals scored Gold Premium, with FIVE of those scoring 8.2 or above! In 2005, 100% of the Der Graf foals presented for scores earned Gold Premiums! Now his foals are entering the show ring as well -- and with superior results! The Der Graf daughter Dancer's Surprise is winning at 2nd Level in Florida for her owner/trainer Heidi Basler. 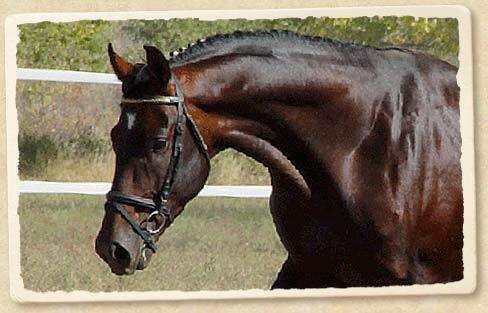 Dance Card, out of a TB dam, is winning Hunter Derbies and Championships in the hunter ring. Der Graf sired both the Reserve Champion Great American Insurance/USDF Breeders Series colt (Dionysis) and mature mare (Die Finesse) in 2008. Der Graf's two-year-old son Dante Alligheri won the year-end title of Reserve Champion West Central Breeder's Series Colt in 2007, and Der Graf's yearling colt Dublin was the Great American Insurance/USDF Breeders Series Champion colt in 2006, while his 2004 filly Dolce Vita finished the same season as Reserve Champion filly! Modern in type, leggy and elegant, Der Graf promises to follow in his famous sire's footsteps in the dressage ring. 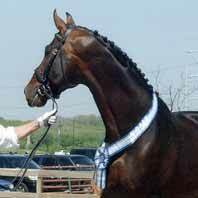 Imported from Germany in the fall of 2000, Der Graf was the sale topping foal, sought after by all, at the 2000 Rheinland Pfalz-Saar Elite Foal Auction in Zweibrucken, Germany. Der Graf's pedigree reads like a who's who of the sporthorse world. His sire, Donnerhall, could be the most successful dressage stallion of all time. Not only was he a many time champion at the Grand Prix level, but he was German National Champion in 1994, a World Cup champion, a member of the Gold medal German team in two World Championships, as well as the bronze medal winner individually. He retired sound and strong at 17 years of age, and his recent death was mourned by the worldwide dressage community. Donnerhall's breeding career, like his show career, is too long for me to list fully, but he has produced more than 50 approved sons in Europe, and many States Premium daughters, as well as numerous successful offspring in sport. The damline of Der Graf stems from the mare Cadarina, Hannover Stamm of 620. It has produced 33 licensed stallions to date including the Grand Prix winner Beldonwelt by De Niro, Donatelli I & II by Donnerhall, and the upcoming stars Beltano by Belissimo M, and Slibovitz by Sarkozy. Other successful offspring of Stamm 620 include the lovely Belle Fleur by Brietling W who competes at grand prix dressage, and the meter 1.30 jumper Casimir by Chasseur. Der Graf is standing at Greenstone Farm in Culpeper, VA.
2016 Breeding Fee: $1,500, includes $250 booking fee.